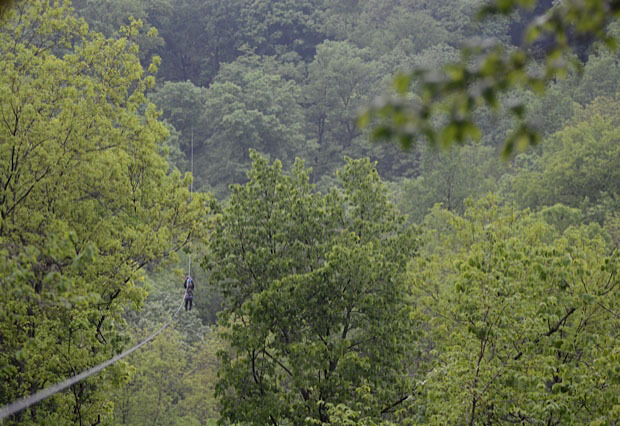 Aerial adventure parks, also know as high ropes courses, offer people the chance to travel treetop to treetop on a variety of rope, wood and cable bridges and obstacles. Aerial parks are growing in number across the country as more people find the rewards of these challenges. These parks often feature elements such as zip lines, rope bridges, log bridges, cargo nets, and many more elements to offer challenges in balance, strength and overcoming fear. While there are aerial parks in nearly every state in America, we have selected 11 to highlight in this article. 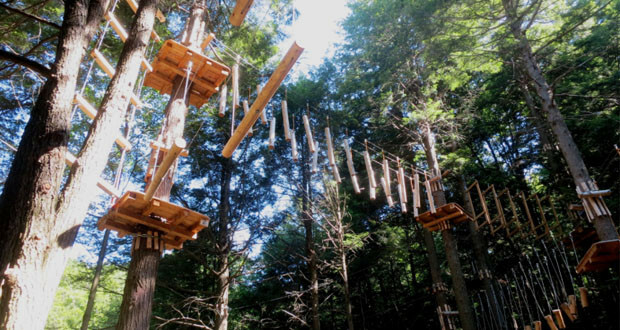 A relatively new park in western Massachusetts, this park has a lot to offer through its 8 aerial obstacle courses. Each course consists of 15-17 elements varying in difficulty . There is also a 200ft suspension bridge that lies 80ft above a ravine. In terms of sustainability, Ramblewild took special care to not damage any trees during construction, they harvest maple sap and lease a portion of their property to a wind power project. For the park itself, zero electricity is used. The lights in the parking lot will be solar powered and completely independent from outside electricity sources. With excellent sustainability and some of the most amazing thrills, Ramblewild offers one of the best options for the environmentally concious thrill seeker. This aerial park in Oregon offers some fantastic thrills such as wobbly bridges, balance beams, and zip lines, one zip line stretches over 1200ft. On top of just offering individual thrills, Tree to Tree provides half day and all day team building programs on both low elements and aerial courses to challenge and build trust between team members. Reservations are required at this park. Test your balance and agility traveling between trees up to 40 feet above ground. They boast the Smart Safety Belay (SSB) system which keeps you secure even when switching between courses. At this course you will encounter ziplines, a trapeze bridge, osciliating walkway, Tibetan bridge, chain loops, log tightrope, log suspension bridge, Himalayan bridge, hanging wooden blocks and more. There five courses to choose from varying in difficulty for every member of the family. Like many aerial adventure parks, Trinity Forest is a family-friendly place offering six courses varying in degrees of difficulty on seven acres in Dallas, Texas. The ropes course is entirely self guided and includes military-style obstacles such as cargo nets, wobble bridges, tight ropes, and ladders, with the addition of participant controlled zip lines. They offer a fun challenge for summer camps, birthday parties or corporate team building groups. The two hundred year old Post Oak trees offer an ideal environment for this aerial adventure park. 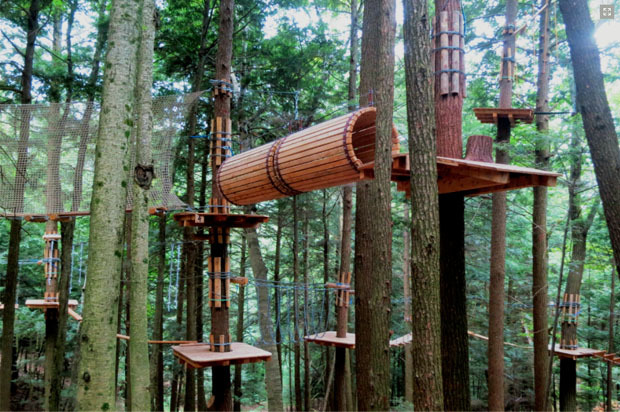 Aerial Forest Adventure Park offers 72 challenge elements spread over 6 courses set on four acres in beautiful hills of eastern West Virginia. Just like a ski resort the courses are labeled from green to black for easiest to hardest respectively. The park sports a new “Mega Zipline” which is a superman style racing zip line where guests lay on their bellies and shoot down the zip line like superman. It’s located just an hour from Washington, DC and Baltimore, MD, which makes it an easy day trip from these bustling metropolises. Offering beginner, intermediate and vertical climbing elements this aerial park has a lot to offer the whole family. This park sports 65 tree platforms connected by bridges, wooden obstacles, rope obstacles and zip lines. In total there are about 1000 ft of zip lines. Three colors section off the courses based on level of difficulty. The green level has 8 elements and says between 8 and 10 feet off the ground. The Blue course introduces zip lines and has 8 elements that are slightly more difficult. 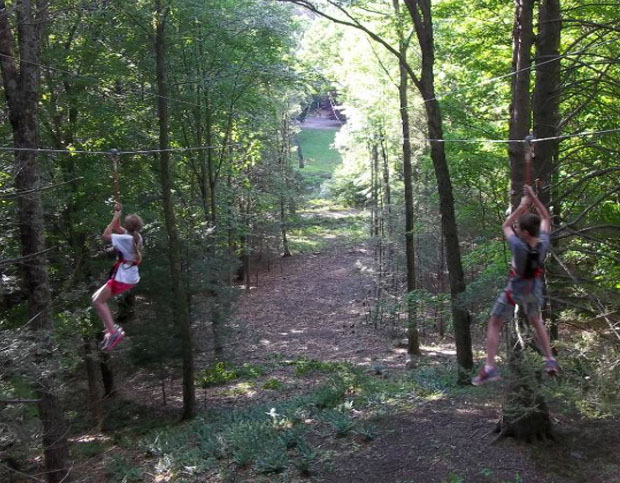 On the black course, adventurous kids can travel between trees over 40 feet in the air with zip lines totaling about 1000 feet in length. They also have a 120 foot suspension bridge between two 500 year old cedar trees. If you are looking for a fun adventurous time this is the place to be. With over 60 obsticles, 20 zip lines this aerial park is a great place to get your adventure fix. It is central Virginia’s largest Aerial adventure park with five trails ranging from yellow to black diamond (easiest to hardest), which provides 3 hours of programing for groups. You will be challenged to grow through this aerial park adventure. This aerial park offers a great choice for all ages. With seven courses and two kids courses there is something for everyone. This park has 5000 feet of zip lines and more than 125 elements to make your way though. Reservations are encouraged but not required. Challenge elements include tight rope walk, rope ladders and bridges among zip lines and other elements. For a good time this aerial park needs to be on your list of places to check out. This place doesn’t just have zip lines, it has two 1000 foot racing zip lines. Prepare yourself to see the world from 40 feet off the ground when you go on the advanced course. This park has 66 elements from rope ladders, aerial tightropes, swinging log steps and Tru Blues. In addition, this park is open year-round so you can brave the cold for off season adventures. Trollhaugen was established in 1950 and is one of the longest-running snow sports resorts in the Midwest. Their aerial adventure park includes 112 challenge elements, plus six zip lines. This places is like a giant, floating playground with six circuits and four levels of difficulty. If you are close to Minneapolis, MN or western Wisconsin, this course is definitely one to look into for your adventure thrills. While this is not technically an aerial adventure park, canopy tours are worth mentioning and this one southwest of Minneapolis is a good one. This guided tour sports 14 zip lines with over a mile in length, a 170 foot suspension bridge, spiral staircases, beautiful views of deep ravines and mature forests. The tour lasts for nearly three hours and is guided by an experienced belayer. The Minnesota River Valley offers some of the most lush scenery and mature woods in the Midwest. If you are in the area, consider this high flying adventure for your next stop.